My family knows how giddy I can be when it comes to steak dinners. As my ultimate favorite food, I didn’t want to miss the chance of trying the best one in Osaka. 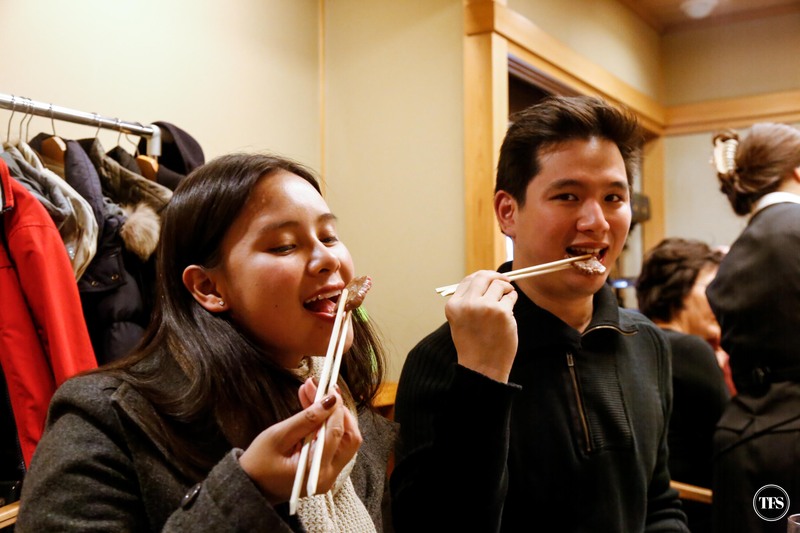 Actually, the original plan was to go out of our way to Kobe just for us to spend the night eating steak. Plans changed after a day at Nara. 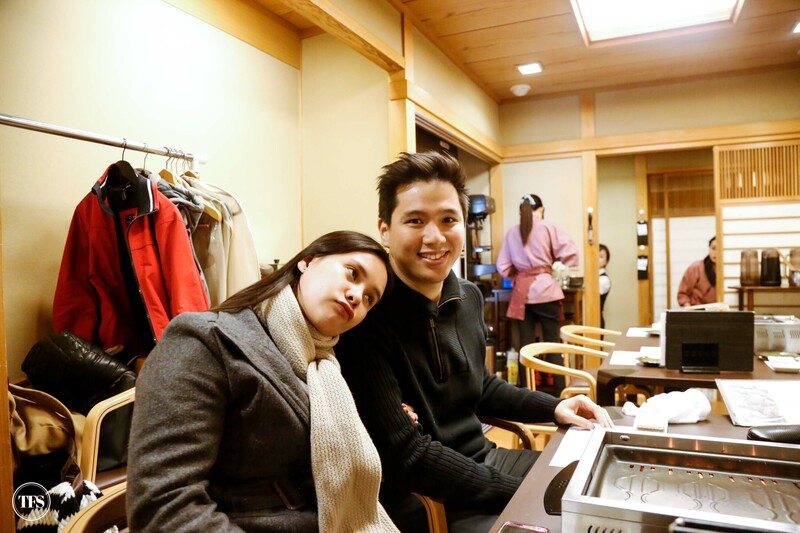 We then just decided to dine near our area in Namba. 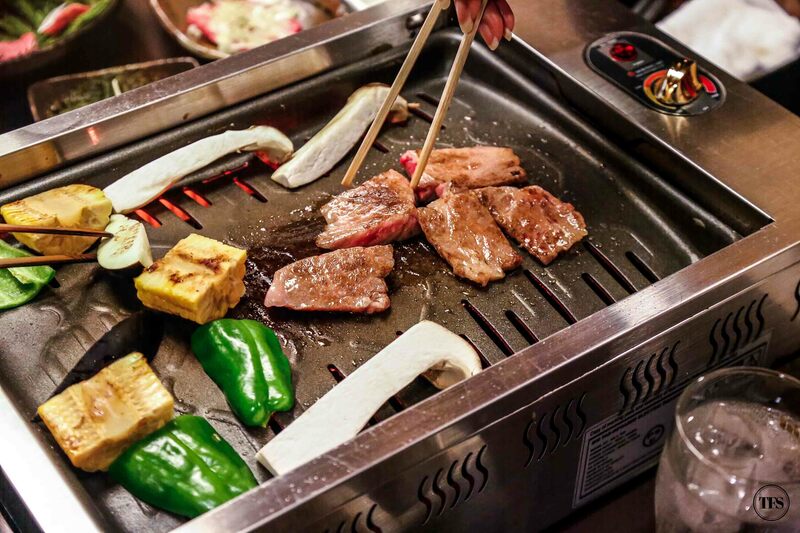 Fortunately, Namba is a few meters away from all the most talked about restaurants of Osaka. 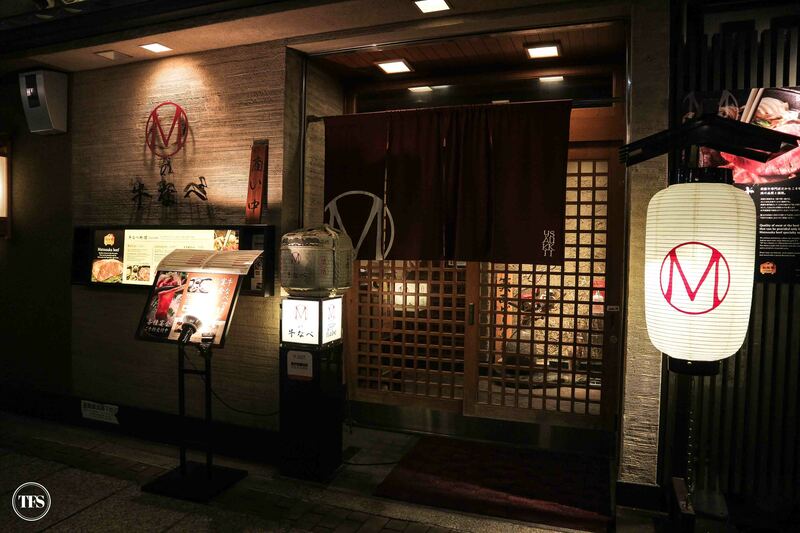 Take Ichiran Ramen for example, and a list of other famous restaurants people line up for. 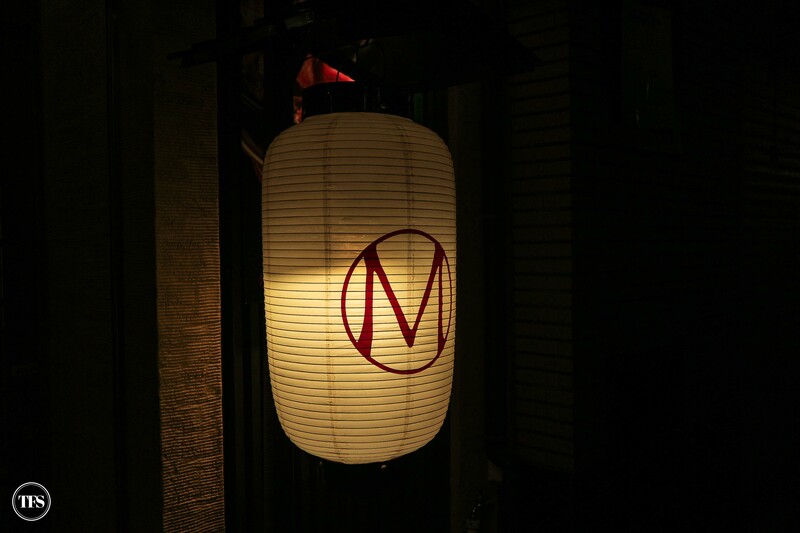 A nearby steakhouse, which happens to be number 1 in Osaka, is Matsusakagyu Yakiniku M.
Without reservation at around 8 in the evening, we hurriedly walked to the Yokocho branch (All thanks to Google Maps!) hoping to get a table for 5. “Do you have a reservation,” he asked. And I sadly said no. Unfortunately, they were packed and couldn’t squeeze us in. I was already thinking of running to the Dotonbori branch to check but I had a strong feeling there were more people wanting to queue at that branch. 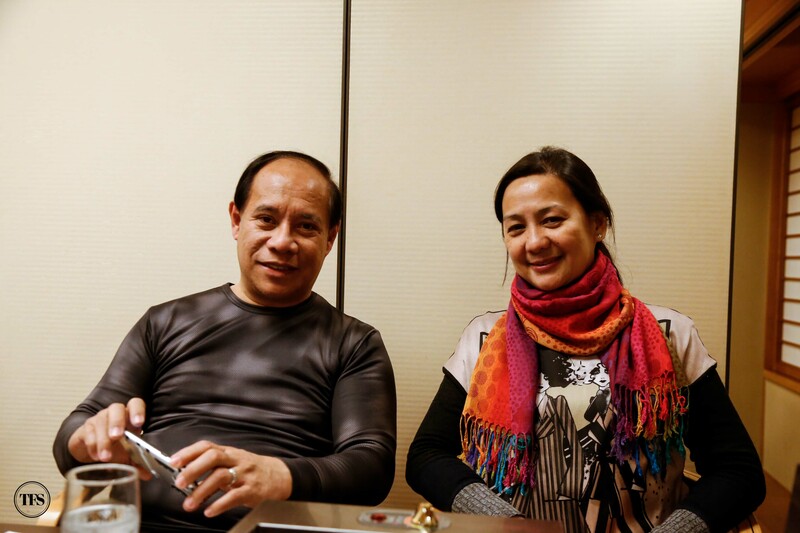 Though our sour sad faces turned upside down when the immediately told us that they will call and check their other branches if they can still accommodate us. Praying and hoping in my head, in a few minutes, one of the staff led us to the nearby branch, just a few steps away, the Gyu-Nabe branch. YASSSSSS!!!! 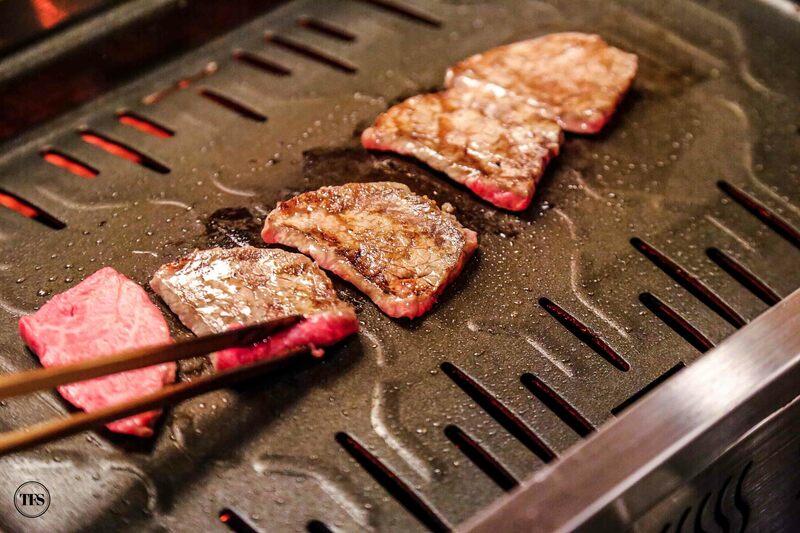 So what’s so special about Matsusaka Steak? 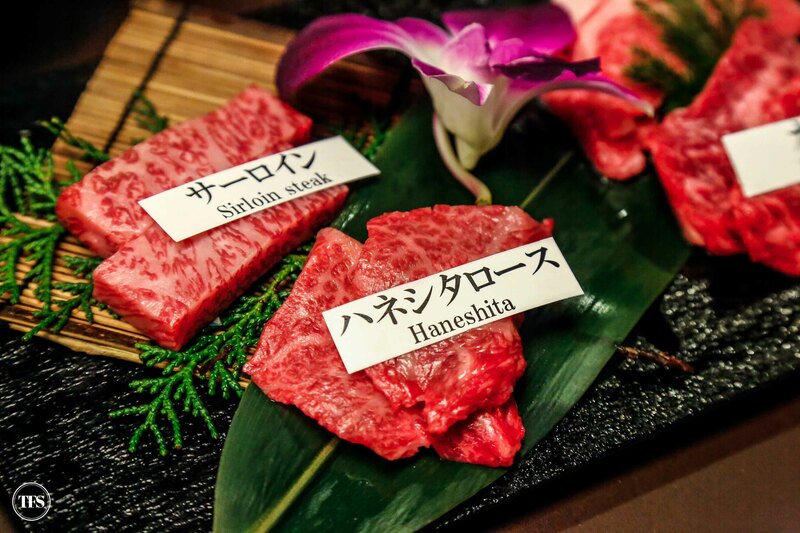 We all know that wagyu beef are labeled as high-end meat because of how all Japanese cattle are raised. 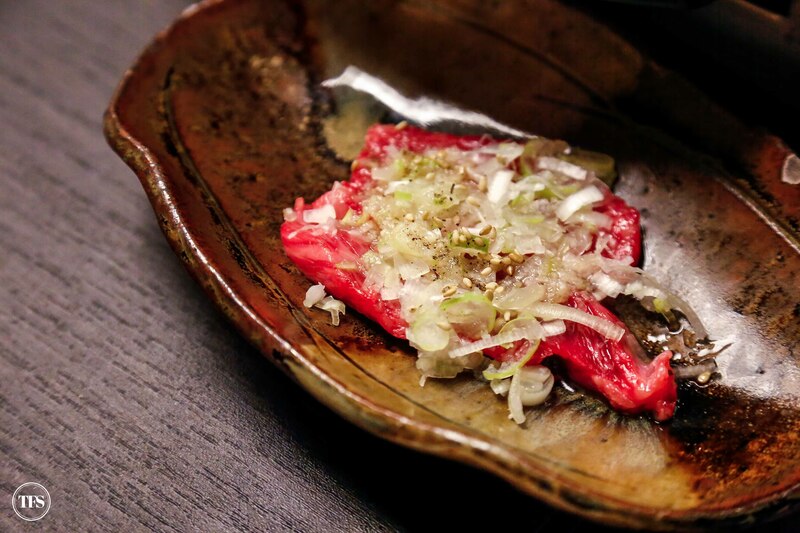 But Matsusaka stands out on its own because of its extra special treatment given. 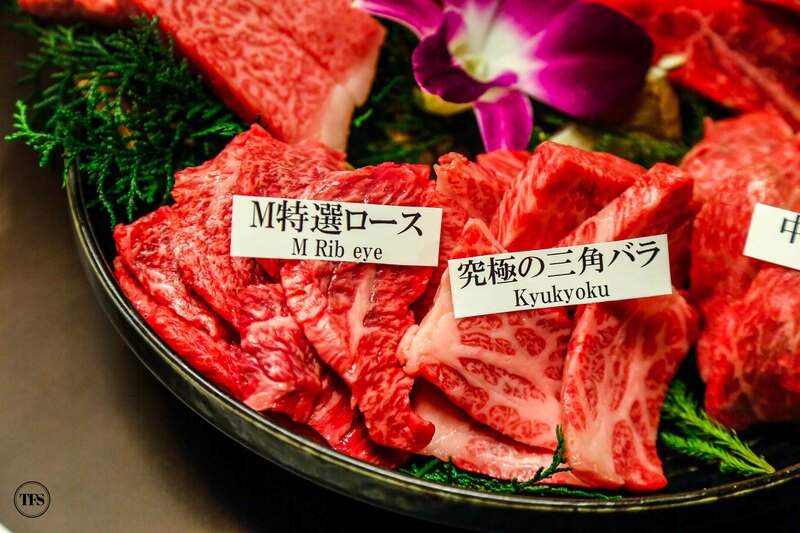 Raised between the Izumi and Miyagawa river in the suburban area of Matsusaka city, for several years all cattle are managed with the highest degree of quality and care. 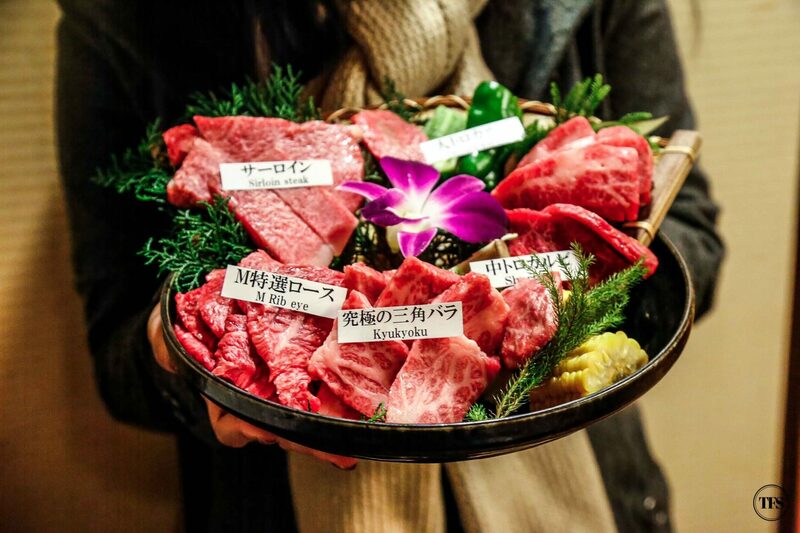 According to Matsusakagyu, all cows are fed beer in order to create a healthy appetite. Plus, be jealous because they are also given a body massage with a mixture of shochu. Now that’s how you define special! The reason why they do these treatments is to create a smooth blood circulation throughout the body of their cows. Also, as I researched about it. I found out that how strict the process of raising the cows. 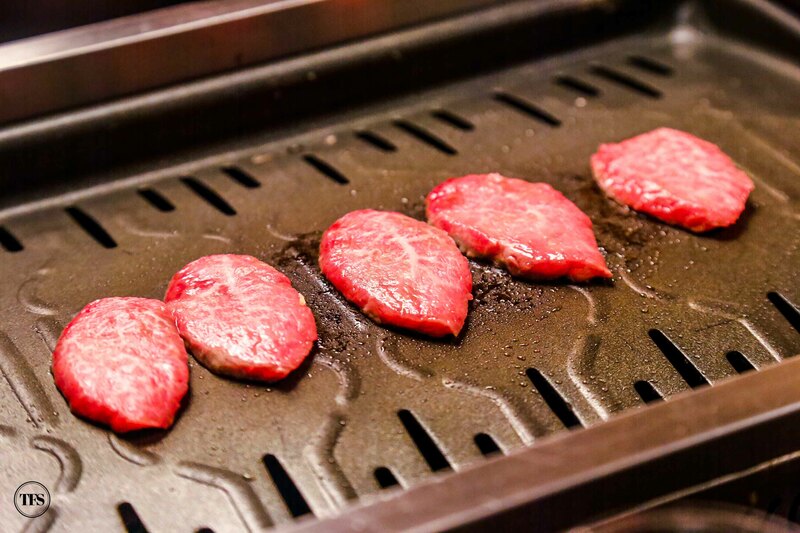 With that said, we can only expect the highest quality of meat at the restaurant. 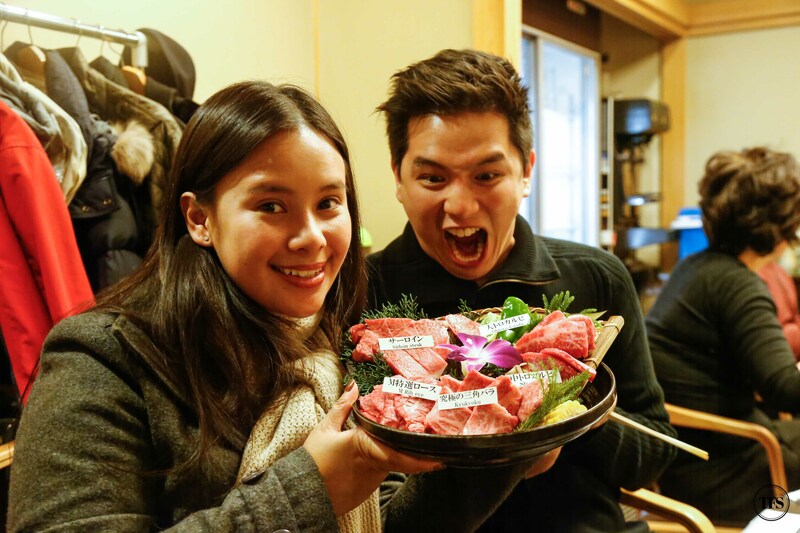 Can you see how excited we were at that time to stuff our bellies with Matsusaka Steak?! 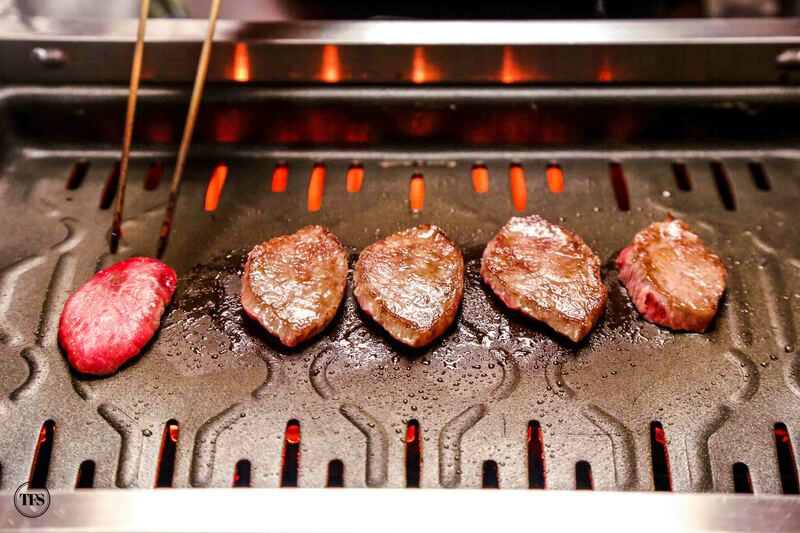 It might not be too obvious but our bellies were screaming out loud for steak! Haha! 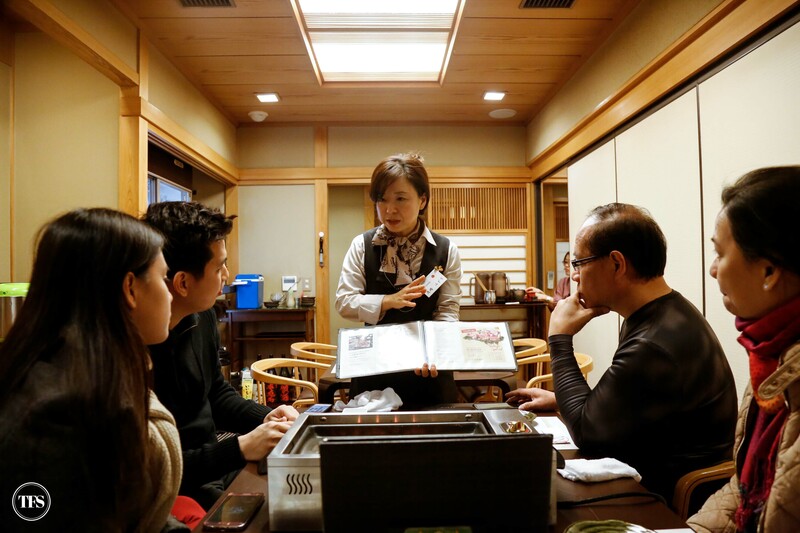 I really felt we were being educated about Matsusaka beef. 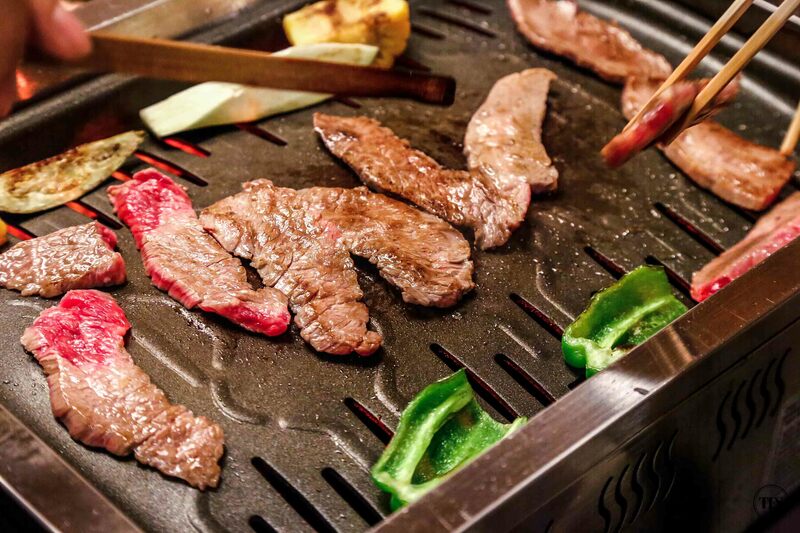 The more the manager talks about the beef, the more I want to take my chopsticks out and slide those beef into my mouth. Hahaha! Ooohlala! It’s what we’ve been all waiting for. 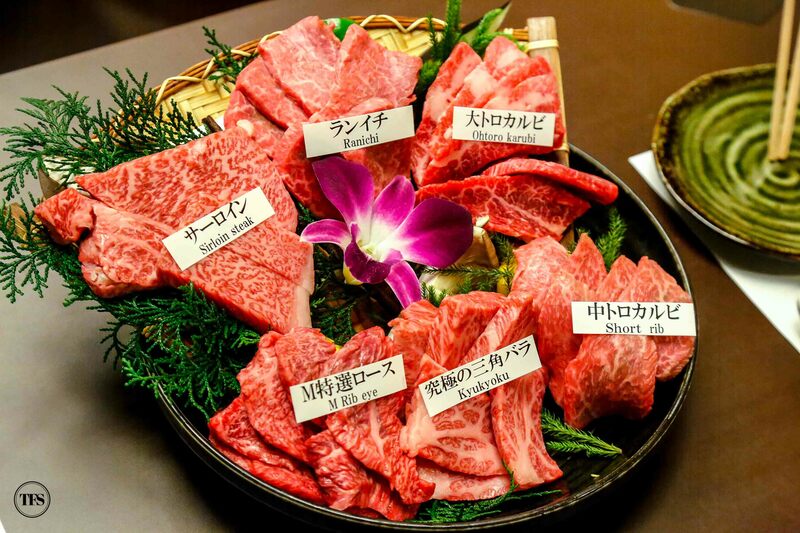 We ordered 2 platters of Matsusaka beef. 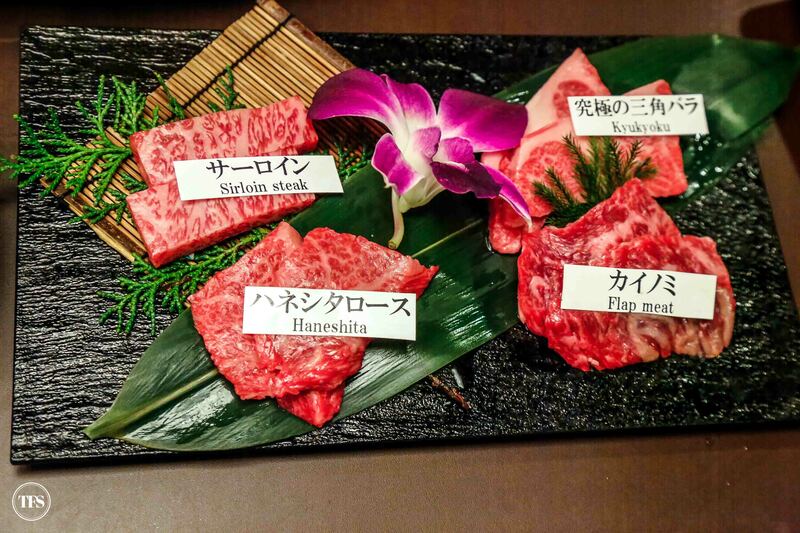 One platter is composed of 4 different parts of Matsusaka beef & 2 different parts of Wagyu. 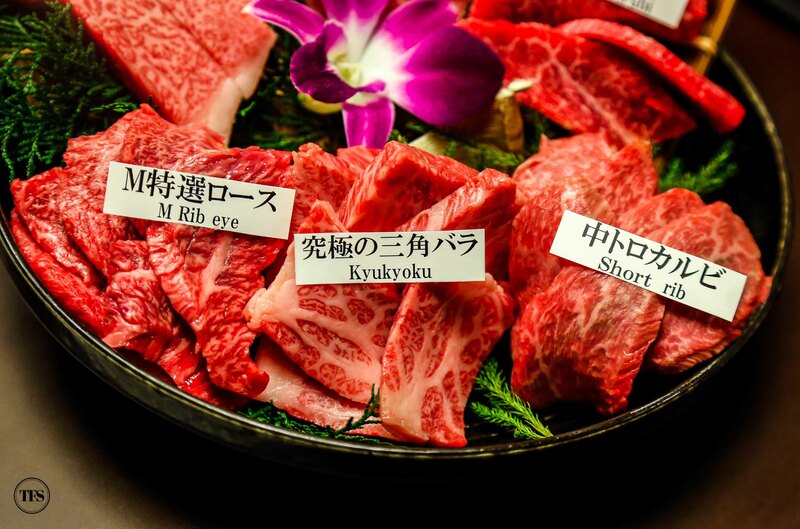 On our plate, we had Sirloin steak, Ranichi, Ohtoro Karubi, Short rib, Kyukyoku and M Rib eye. Now this is my kind of bouquet! A bouquet of steak for our anniversary please? I hope you’re reading this O! Haha! Take a close look at that marbling! It’s so beautiful!!! It’s just perfect! 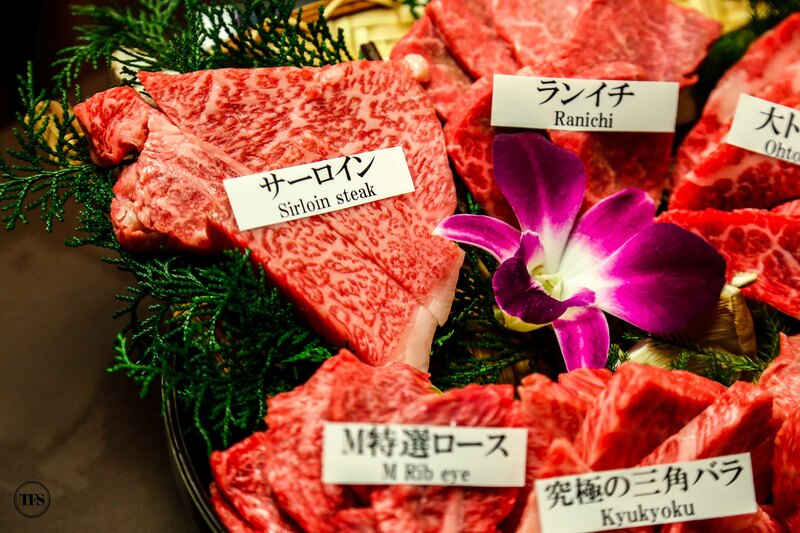 We started with the regular wagyu up to the premium Matsusaka beef and tasted everything piece by piece. Oh dear! I cannot express my joy, tears of joy, after taking a bite. I didn’t want that moment to end. Hayyyy. A taste of heavenly meat! No need to chew too much. It literally melts in your mouth! 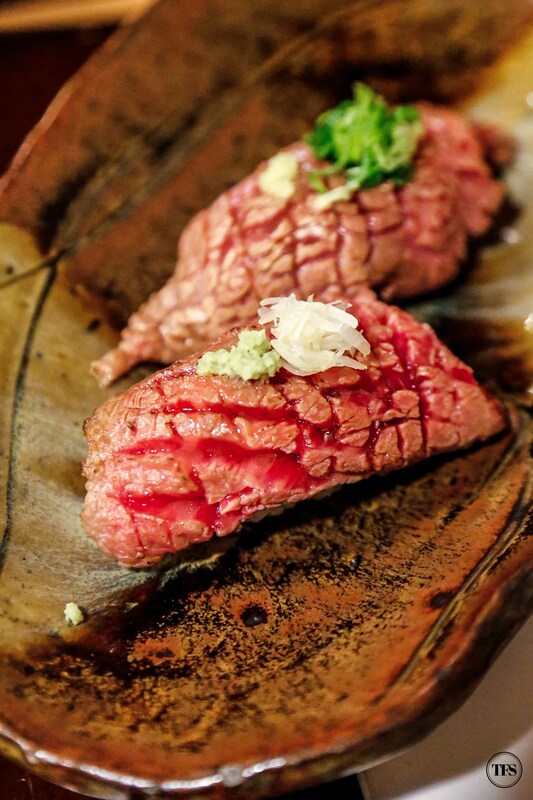 We also oredered 2 pieces of Matsusaka Marbled Beef Sushi because I was curious. FYI, this is the best garlic rice I’ve tried in my entire life! I am freaking serious. 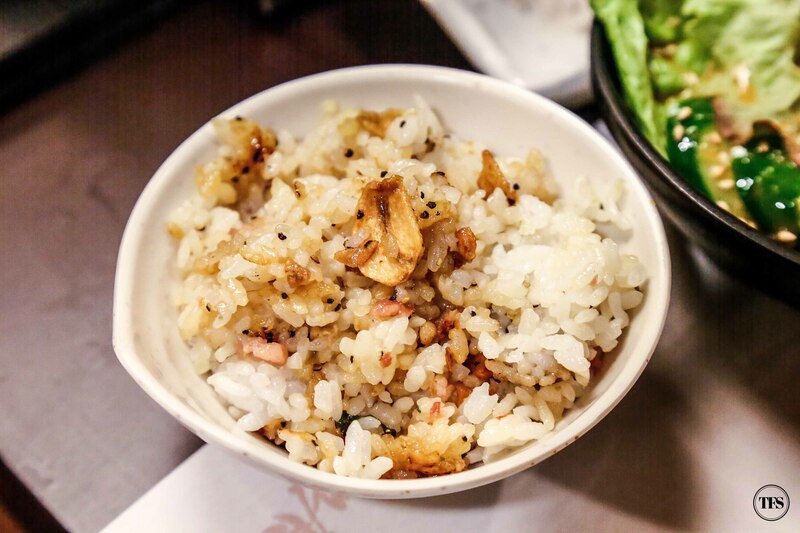 White rice is evenly flavored with garlic and some other Japanese spices. 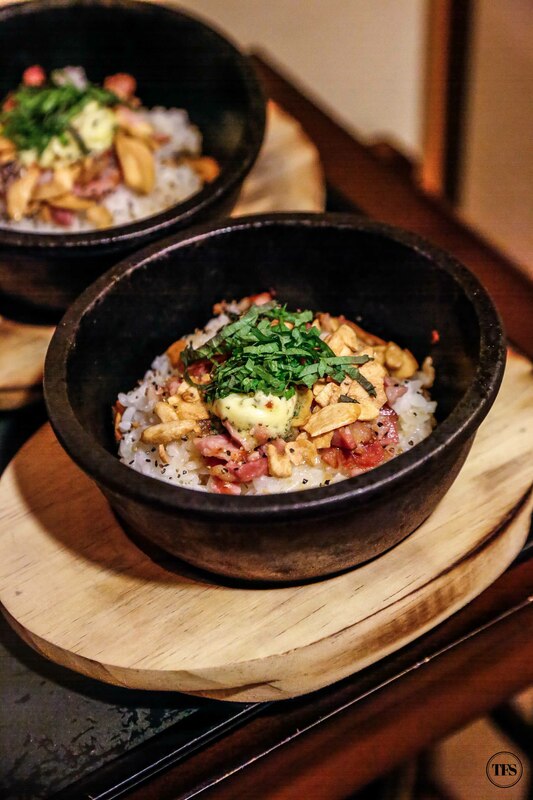 It’s not too salty but the rich flavors are very evident that you can eat the rice on its own. I didn’t expect their garlic rice to be this exceptional. I thought I’d skip rice but one taste magnetized me to scoop and eat some more. That marbling is what you call perfection! As always, mine is cooked medium rare to medium. 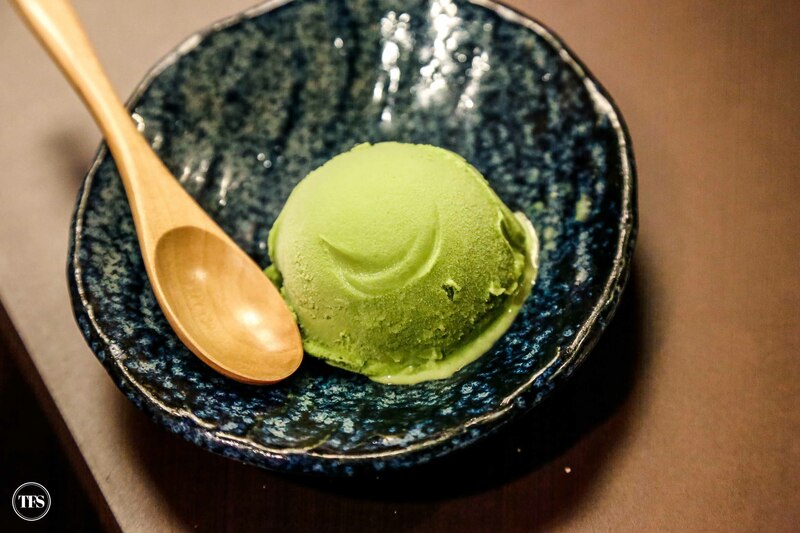 To cap off our perfect Matsusaka steak night, I chose Matcha Ice Cream as my dessert. 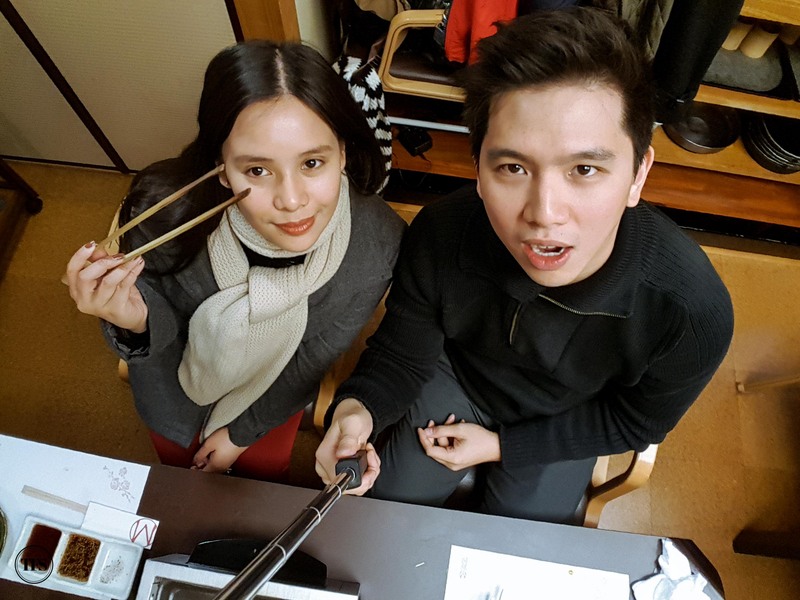 Look at how we take selfies. Hahaha! 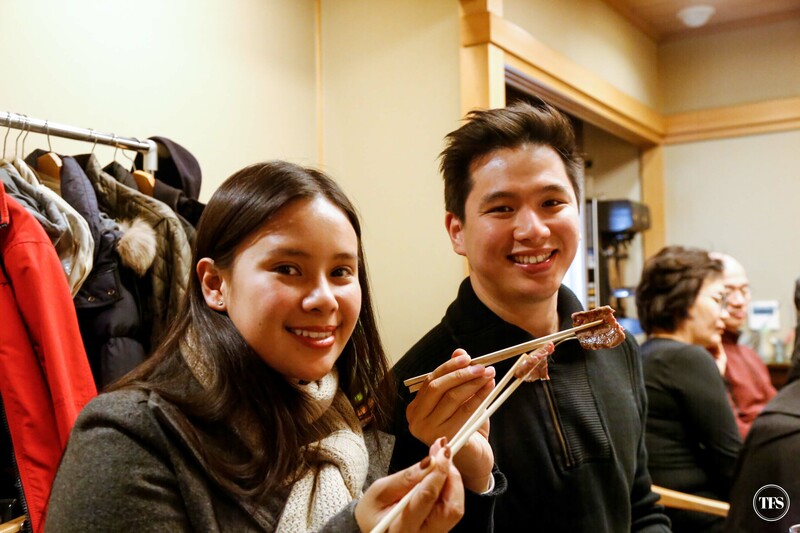 Everybody approves of Matsusakagyu Yakiniku M! 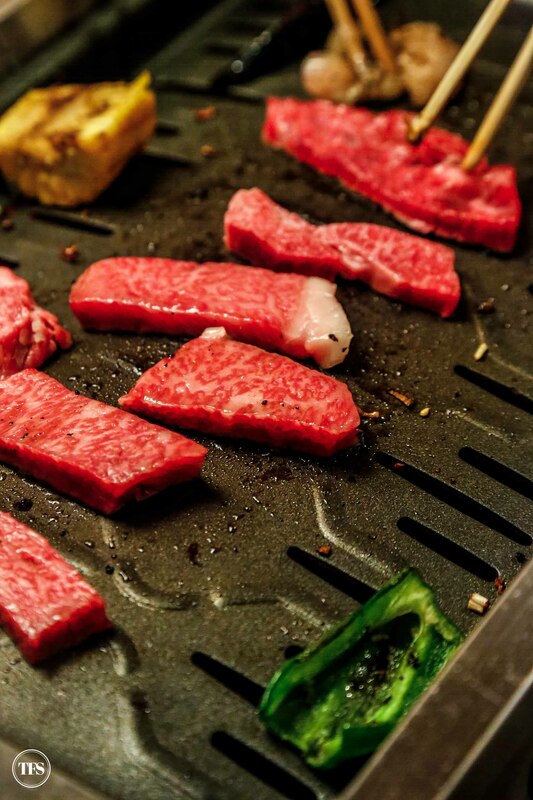 Even until today, whenever we remember our Osaka trip, we would reminisce how fantastic our steak dinner was. It’s now one of our favorite topics when we talk about the best dishes we’ve tried. 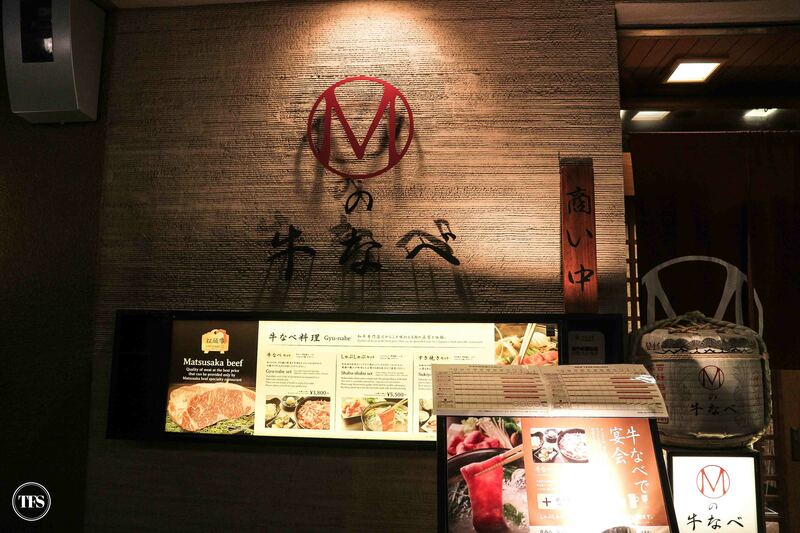 What do you think of Matsusakagyu Yakiniku M? 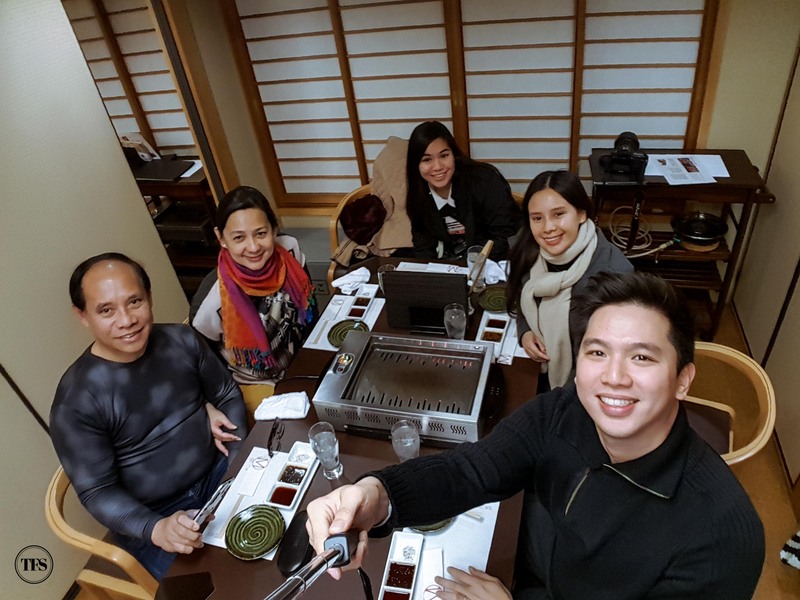 Osaka Japan Diary – Ichiran Ramen, Dotonbori and More! How much did it cost you? How much is the platter or set meal? 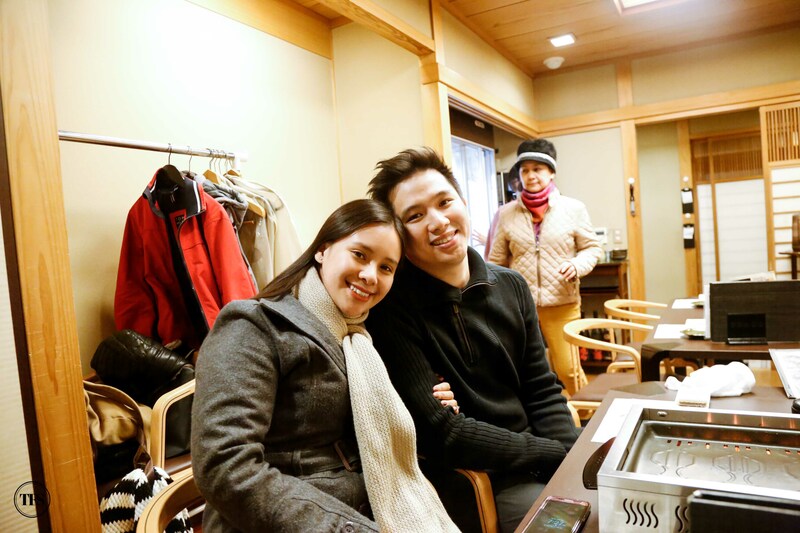 I’m also thinking of going there to celebrate our wedding anniversary.